"Season 3, episode 1 of Pickles baseball is here!" An announced crowd of 2,507 packed Walker Stadium to the edge of each outfield berm on a crisp late-spring evening to watch Portland take on the Port Angeles Lefties. The Pickles' season opener at their Lents Park stadium also was their debut in the West Coast League. After spending its first two seasons in the Great West League, Portland has jumped up in competition to a summer league founded in 2005..
Portland will now face nearby opponents such as the Corvallis Knights and Bend Elks, as well as teams based in Washington and British Columbia. The Lefties held off Portland, 3-2, to spoil the night on the scoreboard, but the Pickles integrated old traditions with different fan experiences to keep the vibe lively. Young fans played catch on the left field berm pregame. Dillon the Pickle, the team's 6-foot mascot, ran a lap around the infield edges to unanimous applause in the first inning. The Pickles' disc jockey reintroduced the ballpark's revered dolphin whistle sound effect immediately after starting pitcher Alex Roth retired the game's first batter. The familiar "Vengaboys" cue brought the crowd to its feet each time the Pickles scored. With concessions lines extending to the concourse stairway, fans indulged in the team's new barbeque tent in left field and Fireball Whiskey stand adjacent to the first base dugout. Certain domestic beer supplies were exhausted midway through the game. Adam Baker, Prime Minister of the Royal Rosarians, threw out the game's first pitch. Donning the charitable group's traditional cream suit, straw hat and red and green sash, Baker fired a strike on the inside corner. "I played catcher, first base and right field, but never pitcher," he said. "I was just hoping to get it to the plate. The key is to stay over the top." During starting lineup introductions, fans greeted returning infielder Daniel Lopez with a loud ovation. The senior-to-be from Pico Rivera, California, played for the Pickles in 2017 and attends University of Portland. "It was really humbling just to be out here and that the crowd actually remembered me," Lopez said. "I really took that to heart." Washington State's Brody Barnum, a Vancouver, Washington, native and son of Portland State football coach Bruce Barnum, brought a fan base that echoed Lopez's. When it came time to introduce center fielder and third-year Pickle Joey Cooper, fans chanted "Coooooooop!" in harmony. "Coming back in front of the home crowd means a ton," Rust said. "I've been out of the game a long time, so playing in front of friends and family was nice. I have a ton coming on Saturday and Sunday." Rust, a sophomore at Skagit Valley Community College, started his career at Oregon in 2017 before injuries forced him from the field. He sustained a hamstring injury this spring and said this summer will be the first time in four years he plays a full season of baseball. Friday night's game took nearly four hours to complete. As a result, the Pickles' promised fireworks display was called off and more than half the ballpark exited. Port Angeles broke a 2-2 tie in the sixth inning. The Lefties limited Portland to six hits and struck out 19. "When you watch an at-bat, you don't necessarily look at the pitches you missed," Pickles manager Justin Barchus said. "You look at the pitches you just missed and foul off. We didn't get beat breaking balls. We just got beat by fastballs." Port Angeles tagged Roth for six hits over three innings — all singles — to take a 2-0 lead. After a wild pitch put two runners in scoring position in the second inning. Rust delivered a two-out infield single to put the Lefties in front, 1-0. "That first at-bat, I knew we had a guy on third," Rust said. "I just had to get the ball to the right side. I ended up getting down two strikes, he threw me a pitch a little out of the zone, and luckily I got some barrel on it." A walk followed, but Roth used a strikeout to leave the bases loaded. Port Angeles got straight one-out singles in the third to add another run. The Pickles debuted their "piggyback starter system." Designed by general manager Gregg Swenson, starting pitchers for Portland will be limited to three innings or 60 pitches and operate on a six-game rotation. Designated relievers will be set aside to finish incomplete innings and pitch later in the game. Barchus said he thought the first trial-and-error run with the system went well. He pointed out that Roth, a sophomore right-hander from Western Oregon, had not faced live hitters in almost a month, because the NCAA Division II baseball season ends in early May. The Pickles made the score 2-1 in the third. Shortstop Gio Diaz was hit by a pitch from Port Angeles starter Kade Mechals with two out, then stole second on a fastball in the dirt. Lopez, batting out of the third spot in the lineup, roped a double to the left field corner to score Diaz. "I was just trying to put the ball in play there," he said. "You have a runner in scoring position with two outs so you just have to find a way." Portland struggled to figure out Mechals' fastball. The right-hander threw three pitches for strikes and mixed in a slide step to keep hitters off-balance. Mechals struck out the side twice and finished with eight strikeouts on three hits. He racked up a high pitch count, however, and departed after 4 1/3 innings. Mechals threw more than 20 pitches in an inning three times and finished with 95. "I guess if you're going to get three-hit, you might as well run the pitch count up," Barchus said. "The guy mixed well with his changeup and breaking ball," Cooper said. "He was able to sneak in the fastball here and there, which we were late on. But it's early, guys are young. We'll get the hang of it pretty soon." Diaz, a sophomore from Saint Mary's, singled home second baseman Jordan Barchus in the fourth to even the score. Jordan is Justin's younger brother and a junior infielder for University of San Francisco. Rust scored the Lefties' decisive run in the sixth off Pickles left-hander Michael Newstrom. Rust led off with a walk, advanced to second on a sacrifice bunt and took third on a wild pitch. With two out, Newstrom struck out the Lefties' No. 3 hitter, but the fastball bounced past the catcher and skipped to the backstop, allowing Rust to score. Newstrom struck out five, walked three and took the loss. "Newstrom, he settled down," Justin Barchus said. "I really think if he can command the strike zone — he didn't get a ton of innings at Washington State — but if he can settle in for us, he can be really good." Portland had the tying run in scoring position in the ninth. Right fielder Jake Berry led off with a single and advanced to second on a sacrifice bunt. But left-hander Baxter Halligan (Northern Colorado, ex-Lincoln High) struck out Jordan Barchus and leadoff hitter Blake McKinney (University of Portland) to pick up the save. Right-hander Nick Parr (Oakland University) claimed the win. He struck out five in two innings. Sam Lauderdale (WSU) and Daniel Copeland (Gonzaga) each made scoreless relief appearances for Portland. Lauderdale, a freshman-to-be on a 10-day contract out of King's Way Christian High in Vancouver, Wash., threw 1 2/3 innings of hitless ball after Roth and featured a fastball humming in the low-90s. Also a high school senior, Copeland retired the side in order in the eighth and ninth innings. "It'll be a fun summer," Justin Barchus said. "Hopefully we can give (the fans) a little more to cheer about moving forward. The stadium's great, fans are great. Excited about that." 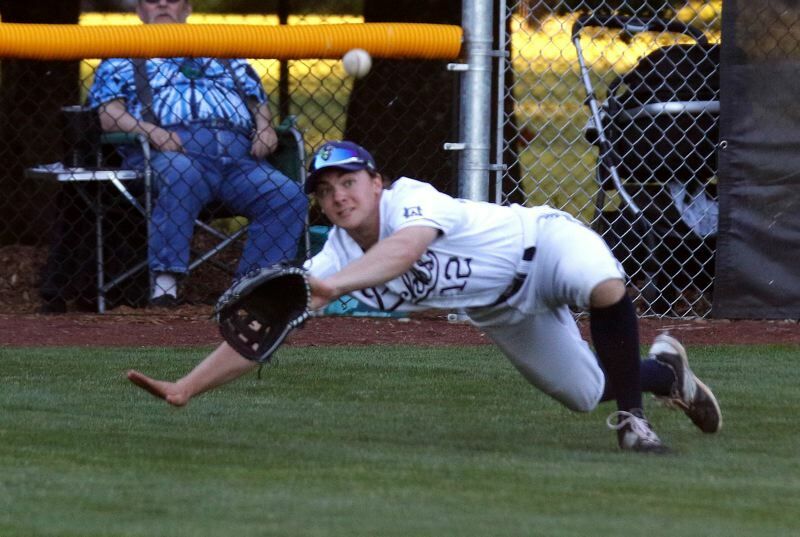 Portland takes on Port Angeles in the second of a three-game series at 7 p.m. Saturday at Walker Stadium. ?